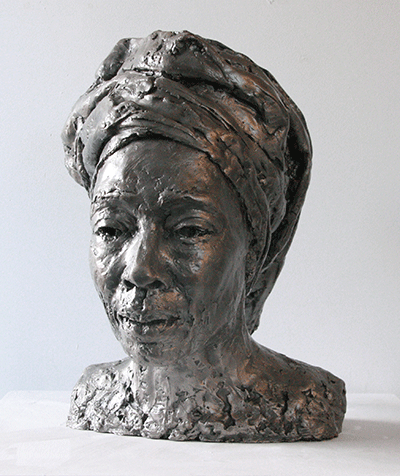 Guns to Goods, an art group co-founded by Middlesex University’s Deputy Dean of Art and Design Professor Paul Haywood, has revealed its latest project – a sculpture of renowned peace activist Dr Erinma Bell, crafted out of recycled metal from seized illegal firearms. The sculpture, unveiled in a ceremony at Manchester Cathedral on Tuesday 8 March, was created by artist Karen Lyons to commemorate the important work performed by Dr Erinma Bell to reduce gun-related crime in Manchester. The iron for the sculpture was sourced from 50 illegal guns seized by Greater Manchester Police. The project was supported by Middlesex’s Art and Design Research Institute (ADRI), along with Arts Council England. Middlesex University technicians Sam Wibberley, Rory Hooper and Rachel Ann Terry, as well as Middlesex graduate and designer-in-residence Ina Norrman, also contributed to the project through materials research and testing. The sculpture continues Guns to Goods’ endeavours to bring attention to the issue of gun crime, and to transform firearms into new avenues for craft and creativity. “The Guns to Goods initiative has benefitted from huge commitment and dedication from so many people in the community,” said Professor Haywood. Professor Haywood, his collaborators and co-founders – the University of Salford’s Sam Ingleson, and Dr Erinma Bell herself – plan to find new ways to engage communities and drive social change through Guns to Goods’ art-based practices. 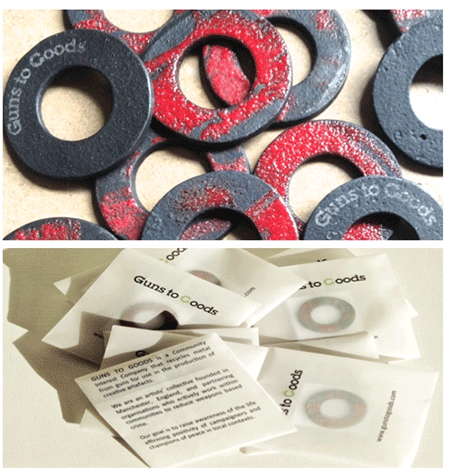 “The Guns to Goods initiative is continuing to explore relationships that will open up networks with authorities and activist groups in other parts of the UK and internationally,” Professor Haywood said. “We want to make more sculpture and we want to exploit the potential of the medium for celebrating local resilience and, in particular, people who have made a significant contribution to positive change. “We are in the process of completing a public sculpture in Manchester that was worked on in collaboration with the charity Mothers Against Violence. This is a series of floor pavers in relief called ‘Paving the Way to Peace’ and it has captured the dance steps and rhythms of a group of young performers who specifically designed a piece of choreography for the sculpture. The bust of Dr Erinma Bell will be on display at Manchester Cathedral until May.